FARM leaders are again questioning the commitment of sheep processors to the sector. “A couple years ago the processors launched their campaign for putting a million extra ewes into the system,” says John Brooks of the ICSA. And collapse is about where we’re at with prices for this week back another 30-40c/kg for lamb, while cull ewes slip 10c/kg. Back in the middle of April Moyvalley was quoting €7.10/kg for lamb and everyone else was around the €6.80-6.90/kg mark. Today those prices have slipped to a uniform €4.90/kg, with Moyvalley not quoting. That’s a €2.00/kg drop, which on a 21.5kg carcase is €43/hd of a fall in three months. I’m not sure I could handle that amount of volatility in my income if I was solely dependent on our little woolly friends for a livelihood. “Snap!” was the reply from one factory agent I was speaking with yesterday as he realised his price for lamb was exactly in line with all the opposition. The reasons given by factory representatives for this barrage of price cuts range from an over-supply in the UK to the hot weather reducing demand for roasts. This week’s price table for cull ewes also has a uniform appearance, with Dawn Ballyhaunis, the two ICM plants and Kepak Athleague all on €2.70/kg – uniformly down 10c/kg from last week. Kildare Chilling offer more with their quote of €2.80+10c/kg quality assurance, but that base price is also 10c/kg less than last week. IFA sheep chairman Sean Dennehy said after meeting the main factories last week that “prices need to stabilise at this stage”. When I headed to Spain in May for a break I had no idea that I would be taking the weather back with me. From a farmer’s point of view that type of statement must appear awfully polite, especially as factory buyers I spoke to yesterday were at pains to point out the prices I was being quoted were for today (Tuesday) only. Finally, some badly needed good news has been the development over the past month of an active shipping trade for store and finished lamb. Michael Harty said that with more sheep about and factory prices under pressure, the mart trade for lambs has become quieter. “We had a bigger sale but with more numbers and factory prices back, the general run of prices was from €110-115/hd,” Michael said. Trade for factory and store lambs was “steady” here, with the lighter store lamb which had been under pressure previously a better trade. 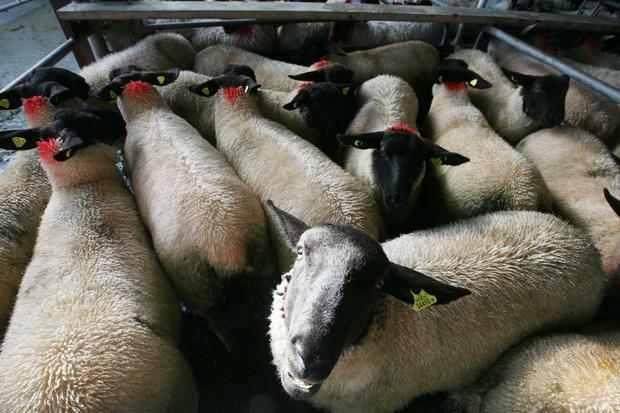 Factory lambs sold for €94-109/hd, while forward stores sold for €75-90/hd. Lighter mountain stores made 45-75/hd. Heavy cull ewes made €80-110/hd, with lighter types selling for €40-70/hd. Trade was described as “easier“ here yesterday on the back of smaller numbers. The majority of the lambs present were of a heavier type. The top price of €128/hd went to a batch of 50kg ewe lambs, with a majority between 44-62kg selling from €105-118/hd. Store and factory lamb sold for €70-127/hd, while cull ewes made €60-136/hd. Trade was similar to the previous week here for heavy, well-fleshed lambs, but lighter lamb and stores were a tougher trade. Butchers’ lambs sold from €109-111/hd, with factory types making €88-105/hd. Store lambs made €60-84/hd. Fat ewes saw a top of €122/hd, with lighter feeding types making €60-96/hd. George Candler is concerned for the sheep producer as prices at factories continue to plummet. “I can accept to some degree that some lamb may be under-finished at present but are markets that bad that factories have had to wipe €40/hd off the price?” he asked. Yesterday’s sale saw butcher-type lambs making €103-122/kg, with factory types making €93-99/kg. Store lambs sold from €62-78/hd. Cull ewes, despite hitting a top of €117/hd, were according to George “a harder sell”. This was a bigger sale that saw good interest in store lamb, although heavier lamb was a tougher sell. Prices for lamb averaged €89/hd to a top of 108/hd. Stag ewes made €83/hd, with the top call being €108/hd. Hogget numbers, while gradually falling away, still saw a top price here of €100/hd. Top price for a ewe with lambs at foot was €210/hd.